Getting ready for Demo Day! The Nestlé team is getting super excited for Demo Day this Saturday! Lots to do before then, so our creative brain cells are working hard right now! Keeping our pitch focused – so easy to get side tracked explaining the challenge/problem! All this feedback and our own reflections had us dive back into business canvassing, prototyping and finalising our innovation! Of course, a big reflection in all of this has been how to get Nestlé on board for this innovation. Having had the chance to meet with the team in Vevey and getting a good understanding of the problems that the company is facing, and beyond that, the difficulties in the cocoa sector in Côte d’Ivoire, has made us understand that there simply is no “magic bullet” that can address all of the difficulties. But we thought a good way to start is to present our quite radical innovation (you’ll see on Saturday!) and show how this could be an opportunity for Nestlé to take their “Creating Shared Value” program to a higher level, and become a pioneer in the field. It might be risky, but we do thoroughly believe that this is a step towards fundamentally improving the lives of rural communities in Côte d’Ivoire. And that’s what we want to get across at the Demo Day on Saturday. Yet another busy and productive week for the Nestle team! After our meeting with the challenge setters at the Nestle headquarters at Vevey, the team decided to revisit the challenge with a new paradigm fuelled by Nestle’s suggestion to think ‘big’. We identified the key ideas/themes to build on. With the feedback and pitching session drawing closer and with suggestions from our mentor to emphasize on why Nestle should buy our pitch and what’s in it for our stakeholder, we are building our ideas using the tools from the design thinking workshop. 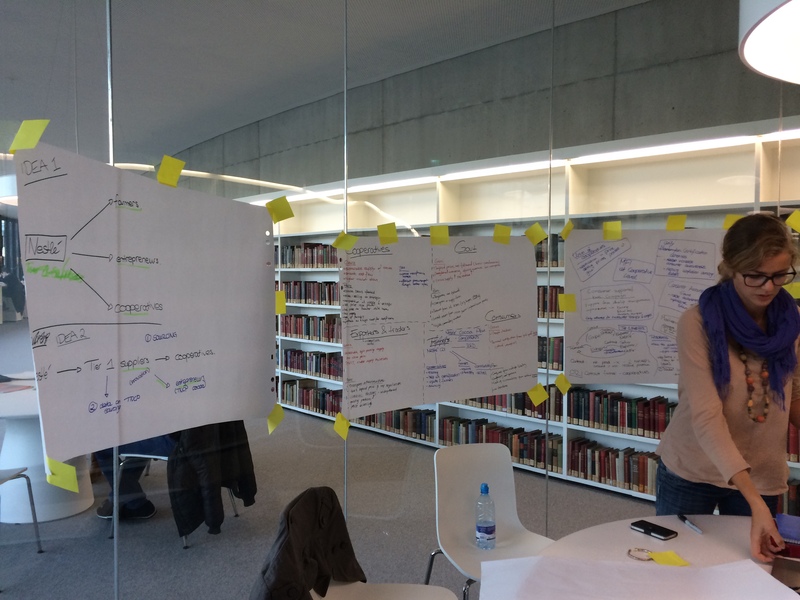 Here’s an image of our ideas canvassed on the library bubble walls to show you how serious things can get. 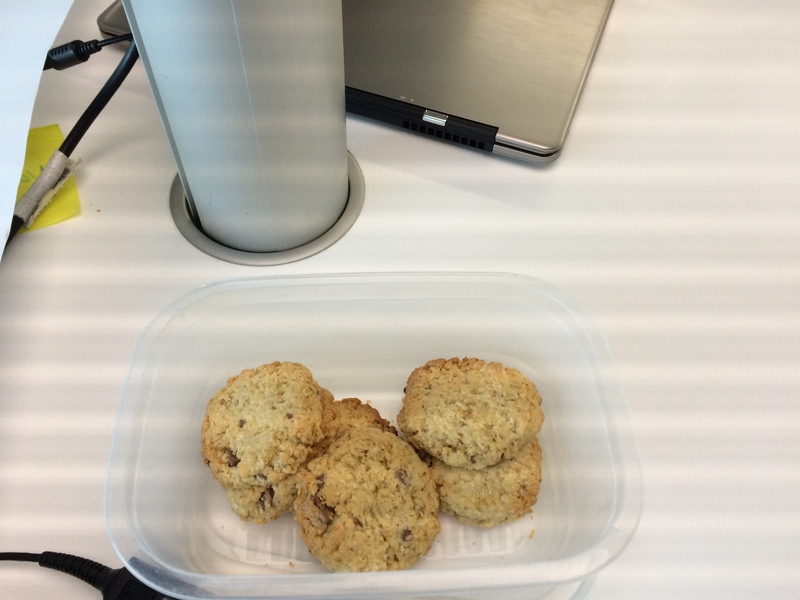 And the motivation from Sara’s home-made cookies did wonders! Needless to say, they were delicious. To figure out how those helped us towards building a sustainable and scalable social innovation and what makes our innovation work, catch us on this Saturday, 15th November at the workshop or on Tuesday, 18th November at the Global Entrepreneurship Week Pitching and Feedback Session. The Nestlé C4SI team has been diligently working to brainstorm and refine our potential innovations over the last few weeks. The cherry on top of this exciting (and productive) journey occurred today. Our team was fortunate enough to take a trip down the lake to Vevey, home to Nestlé’s global headquarters! During this meeting we met with our challenge-setter, Mr. Yann Wyss, Human Rights Manager at Nestlè. Yann graciously offered a guided tour of the building in which we strolled through Nestlé’s exhibition floor and checked out their products from all around the world. We even learned that Nestlé sells numerous types of Kit-Kat bars in Japan, including Wasabi flavor! And did you know Cailler chocolate is owned by Nestlé? We learned a lot about Nestlé’s products with several surprises along the way! After consuming copious amounts of delicious Nespresso from machines placed strategically throughout the building, the real meeting began. We had the pleasure of meeting with Mr. Darrell High, Nestlé Cocoa Plan Manager and Mr. Duncan Pollard, who runs the rural development framework. We presented some of the solutions to our challenges, including identifying key actors in the cocoa supply chain in Cote d’Ivoire through a stakeholder matrix, and offering several proposed innovations. We identified low involvement of women in the cocoa farming, information asymmetry on information and price, low bargaining power of farmers, uncertainty of future supply due to rural-urban migration of youth, and child labor, among others, as potential problems facing Nestlé’s current approach to Creating Shared Value. This brings us to this week’s topic: How does your social innovation fit your target users? One thing that we quickly learned is that we need to continue to apply design thinking in our approach to innovation in Nestlé’s cocoa supply chain. We were confronted with tough, but very useful, questions from Yann, Darrell and Duncan regarding the feasibility of some our ideas and moreover, the role of the private sector in implementing our innovative ideas. We realized that some of our innovations, while creative and potentially impactful, do not fit our target user, which in this case is Nestlé (as opposed to the smallholder farmers). In addressing such a complex challenge involving a multitude of stakeholders, it is often easy to forget who our intended target users are. We hope to reflect on the feedback we’ve received in order to incorporate it into our second round of brainstorming and design-thinking innovation going forward. While we have a long way to go, we are happy to report that we were invited back for a final presentation following our Demo Day presentation in December. We look forward to returning to Nestlé headquarters and are excited for the weeks to come! What could be done to improve the value distribution in the cocoa value chain and cocoa farmer’s living income in West African countries, and in Côte d’Ivoire in particular? 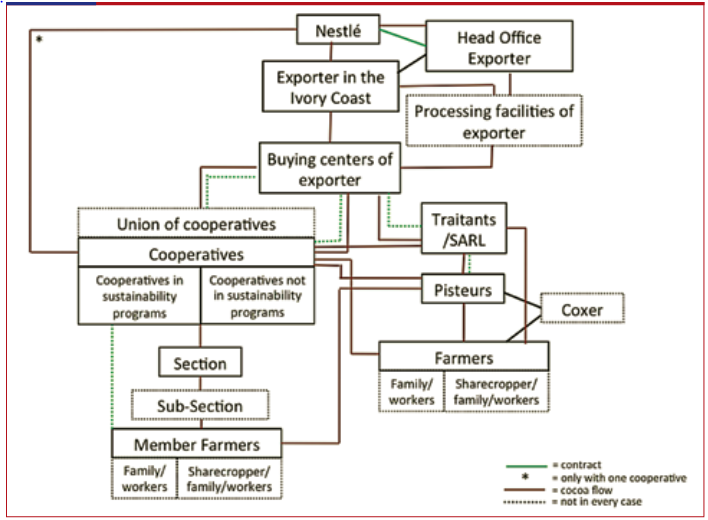 What is the role of the different actors in the cocoa value chain, i.e. farmers, farm cooperatives, traders/exporters, processors, manufacturers, retailers, consumers? What is the role of other, external actors such as the government, international organisations, donor agencies, certification schemes, NGOs, etc.? How would this fit with (and what is missing in) Nestlé’s approach to Creating Shared Value (CSV), and in particular with what has already been achieved as part of the Nestlé Cocoa Plan? As the largest food company in the world, Nestlé is directly sourcing from some 680,000 farms globally and indirectly from even more. Improving the rights, compensation and working conditions of farmers and workers in the Nestlé’s supply chain, and enabling them to participate in a more sustainable cocoa sector would make a difference to millions of workers, their families, and their homeland. In order to tackle and find solutions to this challenge, we found it necessary to first identify the key issues to be resolved through the supply chain. The issues can be categorized as following 1) engaging multi-stakeholders in the Nestlé CSV framework, 2) issues affecting women and children, and 3) sustainable cocoa management. Side-selling of farmers to traitants, outside of cooperatives. Engagement with other stakeholders other than cooperatives. Approximately 80% of Nestlé’s standard cocoa is supplied through traitants, the “unorganized sector” that hides information from cooperatives and farmers. Traitants with an established relationship with an exporter are sometimes pre-financed to buy cocoa beans. With the cash they have, traitants often get cocoa beans directly with lower prices from the farmers. Therefore, we have identified the development of a mechanism to enforce sustainable management of the traitants as a potential key to the solution. We have also considered the efforts of other actors both inside and outside the supply chain, along with relevant national and international actors as critical in tackling the issue. Dominance of men in the production industry. The issue of gender has been widely recognized in the cocoa industry as women are often restricted from the benefits of the cocoa supply chain, facing instances of exploitation and limited access to land. Child labor is still a reality in Côte d’Ivoire, most existing programs and stakeholder efforts concentrate on the elimination of the worst forms of child labor rather than on aspects such as parental care, forced labor, wage and benefits, and health and safety even though these factors could impact the presence of child. Thus integrating measures to confront issues affecting women and children into the fair labor strategy as a whole is important to solve the challenge. 37% of cocoa goes through other sales channels or is of inferior quality and 30% of cocoa is lost due to disease à Is this cocoa sold elsewhere, what is happening to it? Alternative livelihoods: Is it possible to plant any other crops as complements? Another aspect we think is significant in creating share value is protecting the ecological condition in improving the resilience of cocoa to disease and natural disaster. As there is about 30% loss in cocoa due to disease, causing much economic loss to the farmers, we seek to find a countermeasure, such as complementary crops to nourish the soil as a solution. Moreover, we have discovered that cocoa sector has faced the issue of discontinuity, since young people do not want get involved in the supply chain. Nestlé has adopted and is considering introducing a number of certifications to improve the supply chain a a more sustainable and just manner. We would like to assess the benefits and limitation of these certification systems to see how they better serve the people and the natural environment in the supply chain. We believe tackling the aforementioned key issues will help us move closer to finding a solution for the Nestlé challenge.